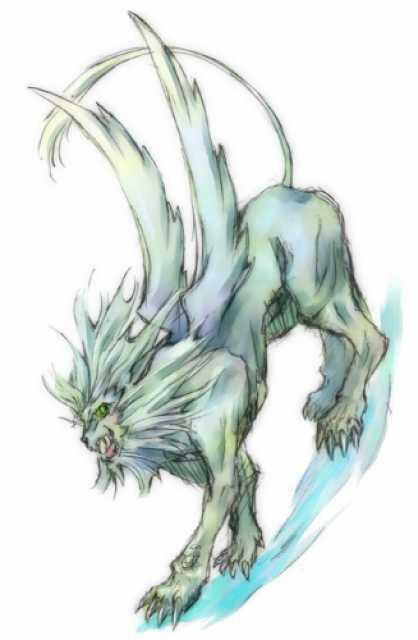 The old magicians said Vapula, the Sixtieth Goetian Spirit, "appears as a lion with gryphon wings." When examining the artist’s drawings, my first feeling is that I am looking at a pixie . . . something that might have flown right out of a Walt Disney cartoon film. There is the tiny face, the massive, almost artistic wings, and the body that coils down and around in an almost insect-like way. Little seems to be known about Vapula. The Seagate web site suggests color and sound in a description that may be somewhat embellished: He has "a red mane. He has great green eyes which seem full of wisdom and his voice is a quiet rumbling." "Vapula is a great duke and a strong, he is seene like a lion with griphens wings, he maketh a man subtill and wonderfull in handicrafts, philosophie, and in sciences conteined in bookes, and is ruler over thirtie six legions (sic)." A San Francisco Goth who calls herself the Rev. Sister Pixie Snakes appears to have an interesting relationship with Vapula. She writes on her web site that she sees this spirit referred to as a male, “but she appears to me as a female. She appears to me as a lion-like creature but with a long snout like a coyote. . . she growled and had a ferocious powerful roar, but she also spoke to me in a very sweet voice. “She told me that she was once an earth spirit in a cave in a desert Middle East place. She would make her presence known to people passing through her territory and would steal their livestock. Eventually people started giving her offerings to appease her and protect their livestock. She started becoming more powerful and people took notice. Eventually she was added to the Goetia and became elevated beyond her original existence as an earth spirit. Vapula holds the rank of duke. She governs 36 legions of spirits.